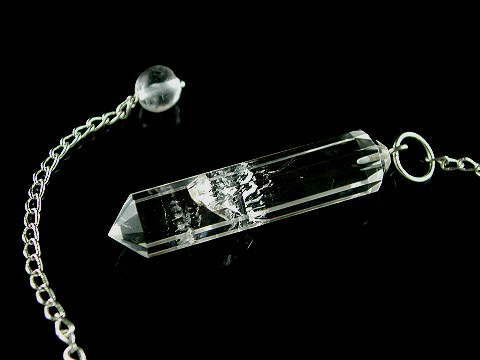 Beautiful, A-Grade, 12-sided, Clear Quartz wand-style pendulum finished with a 6mm Clear Quartz bead. We have two of these pendulums available. Clear Quartz is one of the most abundant crystals on the plant. There are two main forms; macroscopic (large, or 'massive' crystal - usually large pieces of Quartz without any obvious terminations) and microscopic; those with natural terminations. Quartz has six principle properties. It can structure, store, amplify, focus, transmit and transform energy on every level. This is reflected in some of the different, natural formations found, such as Channeller, Generator (like this pendulum), Transformation, Double Terminated, Laser and so on. To read more about Quartz types, click on the 'Quartz Formations' button in the sidebar on the left hand side. Clear Quartz is the only truly ‘programmable’ crystal known to man. This means that you can get a piece of Clear Quartz to ‘take on’ the attributes of virtually any other crystal. If you had a bed of this amazing and versatile crystal, and placed a piece of Amethyst on it for a period of time, it would start to pick up the energies of the Amethyst! Conversely, if you had a bed of Amethyst (or another crystal) and placed a piece of Clear Quartz on it, it would have the same effect. This does not, however, produce a permanent change. You can also programme and dedicate pieces for a specific healing mission of your choice. The clearer the piece of Quartz, the more masculine (Yang) energy it has. This type also tends to have stronger, faster acting energy. The milkier specimens are more feminine (Yin) in energy and are better suited to long-term or chronic conditions requiring slower, more gentle transformation. All three pendulums we have available are almost water clear (Yang); with two having very slight, soft, devic-type veil inclusions, but all are predominantly fast-acting, which is ideal for dowsing. Clear Quartz is superb for cleansing, activating and charging all Chakras and can be used to draw pain out of the physical body. Its versatility makes it a crystal healing essential and the perfect choice for dowsing.